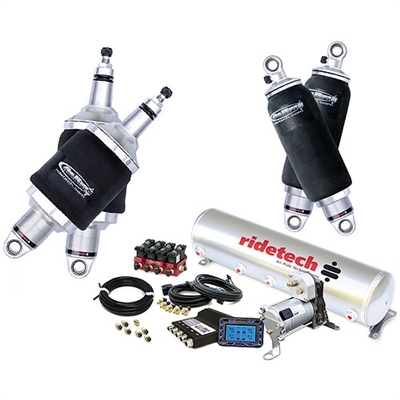 The RideTech system offers a more economical solution to gain the advantage of riding on air. The front HQ Shockwaves are used up front for easy, bolt-on installation and to eliminate tire clearance problems caused by shock relocations. A Bolt-On 4-Link will position the rear more precisely and eliminate the flexing and instability of the leaf spring rear. See the compressor options below to choose your compressor system.